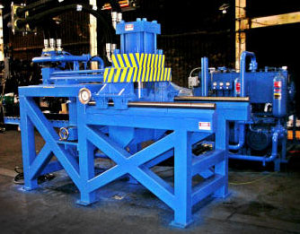 A flying shear Cut-to-Length line assembly allows for the shear to accelerate and synchronize to strip speed to cut material without stopping material feed. This allows for processing an entire coil of strip without accumulating the downtime necessary for shear cycles. 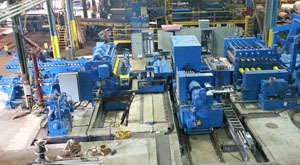 Flying shears are also commonly attached to continuous process equipment such as casting machines. Element has supplied flying shear cut-to-length lines for up to 1/2″ x 96″ (12.7 x 2438.4 mm) steel strip at 150 Feet Per Minute. We have also supplied advanced stacking sections to allow for quick and flush stacking of material bundles. Our feedup sections for coil processing flying shear lines are also designed to minimize strip feedup times.